A. Hone the knife prior to each use if you want to maintain a razor sharp edge. After extensive use, if you have honed the knife and it no longer slices food with ease, run the knife through both Stage 1 and Stage 2. Q. How can I tell if my knife is sharp? A. Use it to slice food. If the knife does not slice the food with ease, it needs additional sharpening. Repeat Stages 1 and 2. Q. My knife is not sharp and I've gone through the whole knife sharpening procedure twice. What am I doing wrong? A. Although unusual, there are times when you will have to repeat Stages 1 and 2 more than once. This may occur during the first sharpening of a knife that has been improperly sharpened by another process previously. It may also occur when sharpening knives of tempered steel which have extremely hard blades, such as some hunting knives. To sharpen these types of knives with the Presto® EverSharp™ knife sharpener, simply continue to repeat Stages 1 and 2 until the knife cuts food easily. Depending on the condition of the knife blade, you may have to repeat the process several times. (In extreme cases, this could be 10 times or more.) This extended process will only be necessary the first time you use the knife sharpener for this type of knife. Thereafter, you will be able to sharpen your knife following the normal sharpening procedure. Q. Sometimes the sharpening wheels stall when I am drawing the knife through the blade guides. What causes this? A. The knife sharpener is designed so that very little effort is needed to draw the knife through the blade guides. If downward pressure is applied to the knife as it is being drawn through the blade guides, the sharpening wheels will stall. Q. How do I get an even edge on my knife? A. To get an even edge, be sure to hold the knife blade parallel with the table or counter top while sharpening. When sharpening the tip of the blade, lift up on the knife handle slightly as the curved portion of the blade is drawn through the blade guides. Q. Occasionally I see sparks when sharpening my knives. What causes this? A. Knives with high carbon content (usually higher quality knives) sometimes will spark when they come in contact with the sharpening wheels. This is normal. Q. 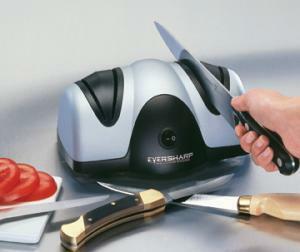 Can I sharpen serrated knives with my Presto® electric knife sharpener? A.Yes, with the exception of electric serrated knives or knives serrated on both sides. To sharpen non-electric serrated knives, use only the slots in Stage 2 and only sharpen the smooth side of the knife blade (the side without the grooves). Draw the knife through the slots using very little pressure. Note: Each time the knife is sharpened, a portion of the serration is being removed. Over a long period of time, the serration on the knife may be completely removed and you may have a knife blade similar to a utility knife. Makes it so easy to get products through the internet. Appreciate the fast service and quality of items presented. I ordered it at home in Texas and it was delivered to my Grandson in Indiana. Josh called me to say "Thank you, Grandma" last Friday. I was happy! We bought this sharpener as a gift because we were so pleased with the one we bought for ourselves. We really like shopping at your company.